Good news! LinkedIn has updated the way we see our LinkedIn Company Page managing site. A renovated look of the interface plus a combination of new features. This allows to take the engagement to the next level by leveraging this advance: a step forward for your social listening & sharing strategy and the foundation of your online brand. New Headline field which is called ‘Tagline’. Start defining and establishing your online brand by showing at first glance the value you can provide to your network. A new call to action element called ‘Button’ . 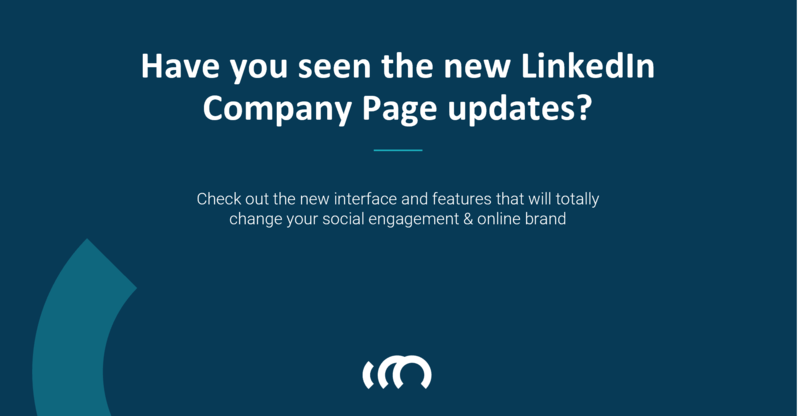 Now you can customize the next step for your LinkedIn Company Page visitors to follow after getting interested. You can choose between visiting your website, contact us, learn more, register or sign up. That will allow to make the journey towards communication much easier than before. It will also enable the possibility to generate another via towards generating leads & visitors. Time to renovate the engagement side, your social listening & sharing strategy. It’s been released a new section called ‘Content Suggestions’. In there you can find relevant content that is trending and being engaging for a large-size community. It includes also an important element that is categorized as ‘% of engagement’. That will allow the users to identify the most engaging and trending topic to be shared. A fantastic opportunity for you to personalized and quickly share content that is being trending. Check the video to see how it looks like and where to find the news and features. However, the most important thing is START using it and creating value for your community. Reach us to get to know more about other news and features as well as to get professional help to strategically leverage your LinkedIn presence.